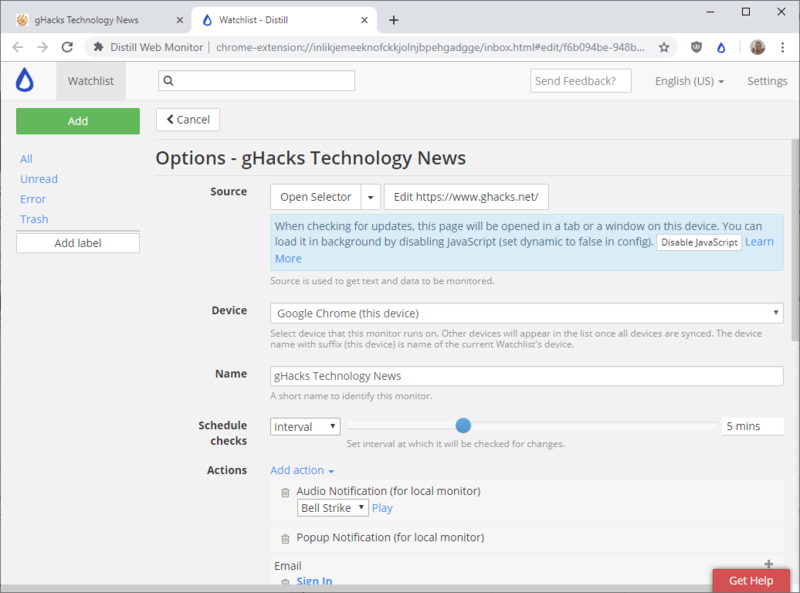 Distill Web Monitor is a free browser extension for the Google Chrome and Firefox web browsers that you may use to monitor webpages for changes. Internet users have some options when it comes to monitoring changes on webpages. They may use RSS for that if the site uses it, or extensions or services that monitor changes. Monitoring changes can be useful in many regards: to monitor price changes for items of interest, be informed about updates, or changes to the availability of items. Distill Web Monitor is available for Google Chrome, Mozilla Firefox, and Opera officially. The free version requires no account but is limited in several key aspects. You can add up to 25 page monitors to the extension of which up to 5 may be cloud monitored. Paid versions increase the limit and other parameters. Distill Web Monitor adds an icon to the browser's address bar that acts as one of the indicators for changes and is used to create and manage new monitoring tasks. A click on the icon displays current monitors and options to add a monitor. 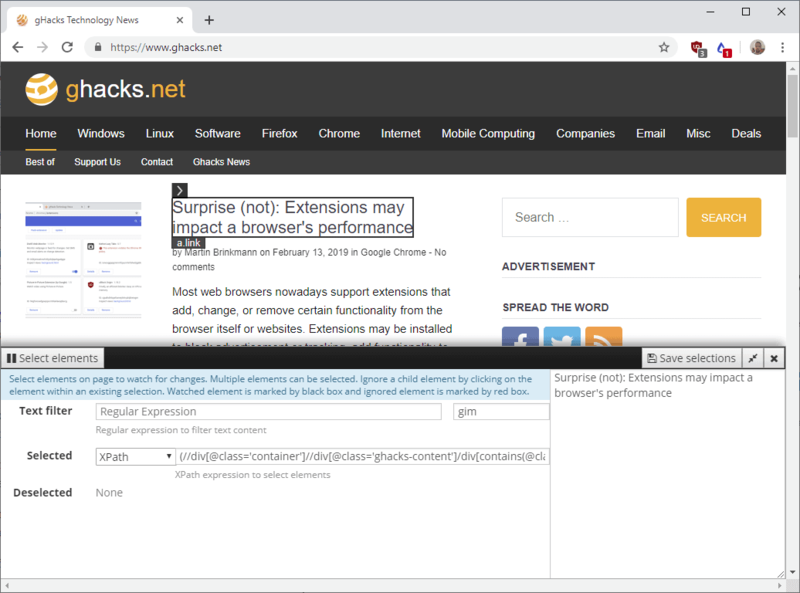 Monitored pages with changes are displayed at the top of the list; a click opens the page in a new browser tab directly. Buttons at the top provide you with options to stop the monitoring process, mark all changes as read, or open all pages with changes in new tabs in the browser. New monitors are added easily using the extension. You have the option to monitor the entire page or select parts of the page. Full page monitoring is easier to set up but it may result in false positives as all parts of a page are monitored for changes. The custom monitoring option works similarly to how Inspectors work in the Developer Tools. Just move the mouse over an element that you want tracked and click on it. You can click on multiple items to add them all to the list of monitored items. Advanced users may use different selectors and even add items to the list of monitored items manually. A click on "save selections" saves the selections and opens the second configuration page. You can change the name of the monitored page and the interval, e.g. to every 5 minutes or once a day. Last but not least, you may enable audio or popup notifications for local monitors. Email monitors are supported as well but you need to create an account to use them. 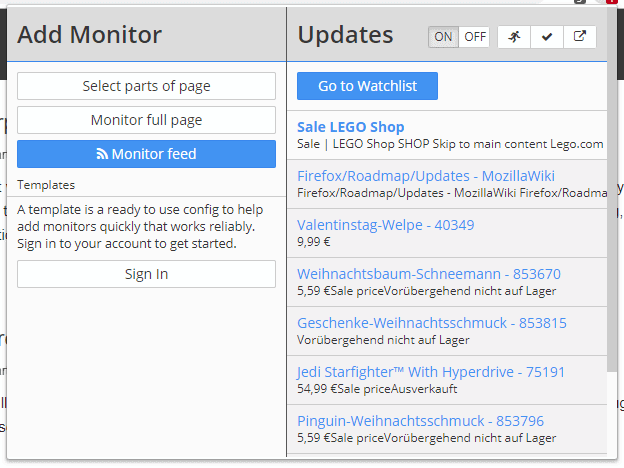 Distill Web Monitor is a useful extension for Internet users who want to keep track of items on web pages. You may use it to monitor prices, updates, the availability of items, or the relationship status of your secret crush on Facebook. The main limitation of the free version is the number of items that you monitor and the notification methods that you may configure. Paid versions increase the limit and unlock additional functionality.